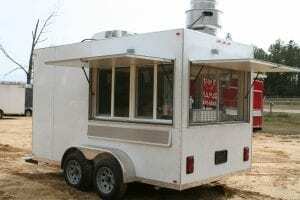 Russell Concession is a family owned business and has been manufacturing concession equipment for decades. Our products go back as far as the early 1900′s, and we have extensive experience in the food concessions industry. We are not a re-seller of equipment; we are a manufacturer to your specifications. 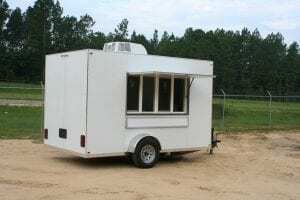 At Russell Concession we encourage all clients to be very active in the design and development of their new mobile concession equipment. There are many sizes and interior choices available. The design and image, the practical features, the overall “feel” of your custom concessions equipment are all customized to fit your needs. 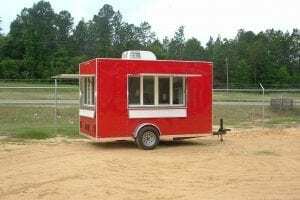 We are exceptionally informed and experienced, and we know how to make you the proud owner of the concession equipment you have always dreamed of. Call us to speak to a sales agent at (601) 947-6160. There are many different levels of catering, some involving simply serving food that was prepared off-site, while some call for all or most of the cooking to be performed on-site. 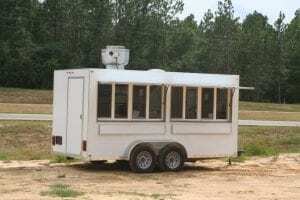 The scale of the catering operation, the type of affair being catered, the sort of food offered and the venue are some of the factors that will determine the capabilities needed on a catering trailer. Regardless, the common denominators are nearly always speed and efficiency. 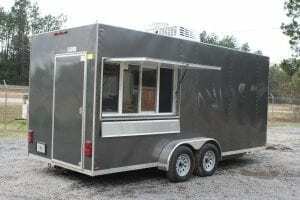 That means sufficient equipment, ample counter space and numerous serving windows, at a minimum. 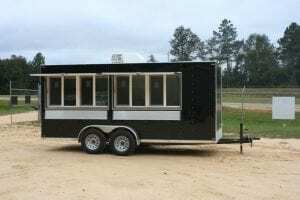 After building catering trailers for more than 25 years, Russell Concession & Mobile Kitchens, Inc. is eminently qualified to design and build the optimum system for any catering service. In order to ensure that each system fulfills its intended purpose to our exacting standards, we involve the client in the design process from the beginning. 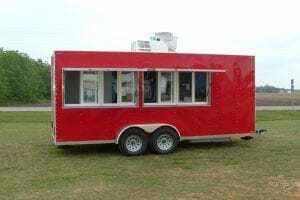 Together, we walk through every step of the food preparation and service process, then consider every conceivable problem, so that the catering trailer we provide will offer the flexibility and efficiency the client deserves. 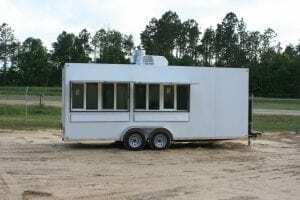 Our typical trailer features stainless steel prep areas, washable walls, commercial grade exhaust hoods and whatever upgrades or downgrades of equipment the customer may desire. 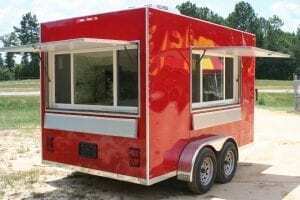 The trailers are offered in fade-resistant glossy white, black, charcoal and candy-apple red, to provide an attractive and durable appearance, fitting in with the anticipated venues. The options available are virtually unlimited – our designers will find the best way to provide whatever the client needs. Unlike some trailer providers, at Russell Concessions, we don’t cut corners on quality or workmanship in order to keep our prices low. We send each system out the door as an ambassador of our company, with our top quality materials and expert workmanship as testament to the excellence of our trailers; yet we still manage to consistently beat our competitors’ prices. 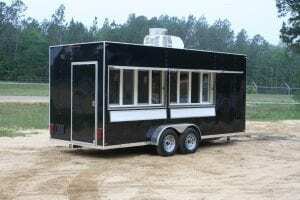 Contact us and let one of our design professionals explain how we can supply you with a highly efficient and cost-effective catering trailer that will give you many years of outstanding service.